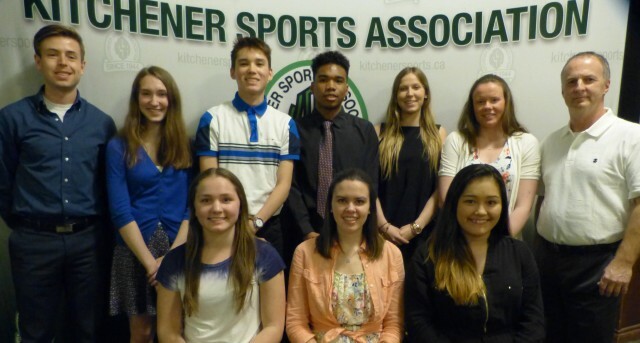 Updated Friday January 19, 2018 by Kitchener Sports Association. PHOTO: KSA Scholarship recipients for 2017 (Back row L-R): Samuel Baxter (guest speaker), Savannah Campbell, Connor Goto-Carter, Terrell Piper, Mikayla Carmichael, Courtney Higgins, and Bob Fedy (Chair of the KSA Scholarship Program). (Front row L-R): Kristen Strauss, Samantha Dilgert, and Cassey Leader. Samuel Baxter, a graduate of St Mary's Highschool, was one of the top distance runners in Ontario and all of Canada when he sped to a 9:12 two-mile. He was a 4 -year cross country and track athlete in high school as well as a four-year swimmer. He was an indiviual CWOSAA Champion in the 1500-meter race in 2010, 2011 and 2012, and he was a 3000-meter champion in 2011. He went on to Cornell University and was an integral member of its cross country and track teams - but that's the next chapter! Congratulations to each of our scholarship recipients and best wishes as you enter the next segment of life's journey. Samuel Baxter, who just completed university, imparted some words of wisdom, not only for them, but for everyone else present as well. As always, this was an informal meeting. If you're involved in one - or more - of the local minor sports groups or want to become involved with one, our dinner meetings offer a great opportunity to learn about the local minor sports community and how we can help each other. Upcoming KSA dinner meetings: May 16 (Athlete of the Year) (Golf's Steak House) then we all break for the summer!